As ranchers in Washington’s wolf country head into another summer of grazing their herds, it’s also a season of worry and hard feelings over management of the predators. STEVENS COUNTY — Bellows and bedlam echo across the valley as Rhonda and Kevin DalBalcon keep up a slow, steady pressure on the cows and calves they are moving. “C’mon, girls!” shouts Rhonda, her long braid flying as her horse deftly cuts off cows that balk, redirecting them to the herd. Good as they are at this work, a new player has ranchers here on edge. 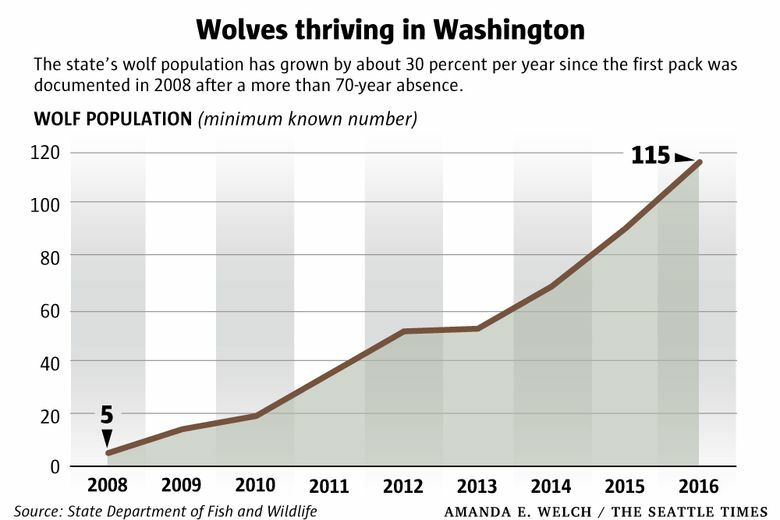 No one in Washington has borne the brunt of adjustment to the return of the wolf like the families here. Washington is home to a minimum 115 wolves in an estimated 20 packs. But 11 of those packs are bunched up here, overlapping grazing allotments in the Colville National Forest. As wolves once again raise their pups this summer, their growing families and appetites raise a specter of dread in ranching country. Last summer, 15 cattle were killed or injured by the Profanity Peak pack — most of which was in turn killed by the state. 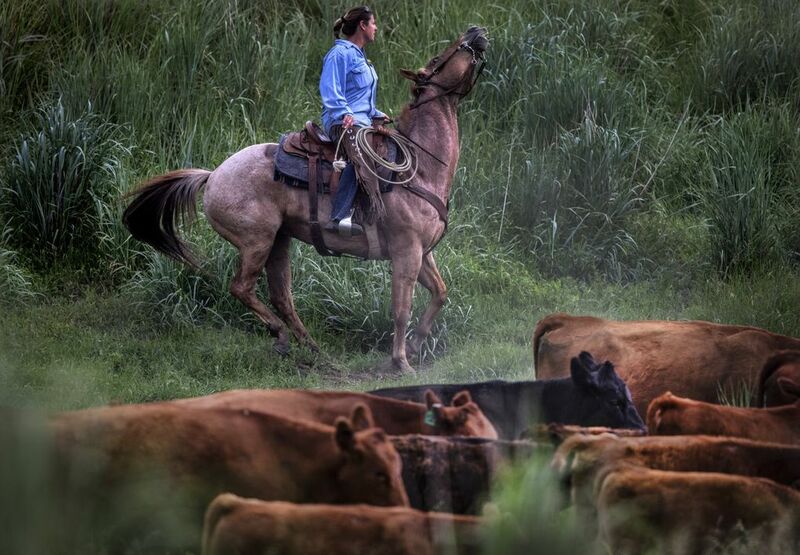 Apart from the complications and expense added to their management routines, ranchers are animal people. And they don’t like what they see, either in cattle eaten alive by wolves, or wolves shot dead by the state. Moving the cattle somewhere else to avoid conflict if wolves show up — or kicking them off the national forest altogether, as some critics would like — isn’t so simple. The Colville National Forest is a 1.1-million-acre sweep of country covering Ferry, Stevens and Pend Oreille counties. Grazing here has been federal policy for more than a century, and the calendar of when and where to turn out cows on the land is set by the condition of the land and by federal management policy. Flexibility is limited. The state’s wolf-recovery program playing out on these federally managed public lands — where ranching has been encouraged since the forest was founded by executive order of Teddy Roosevelt on March 1, 1907 — is actually working very well, notes Mike Herrin, Republic District Ranger for the Colville National Forest. If the score is kept just on the basis of live wolves and dead cows, the numbers bear him out. Statewide, nine cattle were confirmed killed by four packs and one lone wolf in 2016, including the six confirmed killed by the Profanity Peak pack. 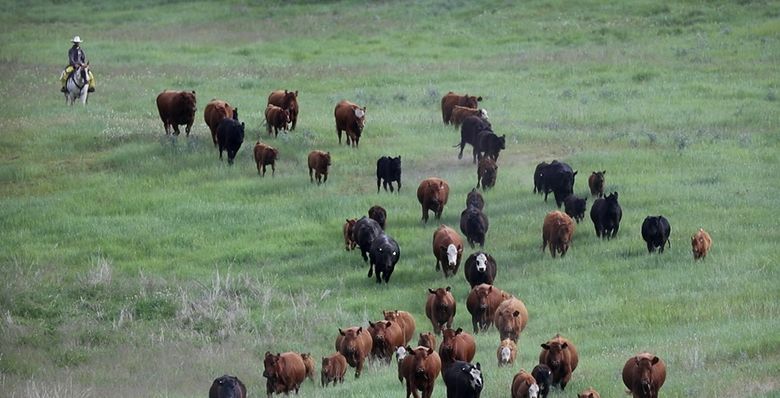 Even if far more were killed or injured by wolves than ever found or proven — say 200 cows — that is a small fraction of the 4,476 cow-and-calf pairs turned out on about 1,000 square miles just on the Colville National Forest alone last year, Herrin notes. Far more cattle are killed in Washington by lightning strikes, logging trucks, illness and accidents, put together, than by wolves. By now, wolves that initially moved in from Idaho and Canada are so numerous in Eastern Washington that unlike in Western Washington, they already have been removed from the federal endangered species list. 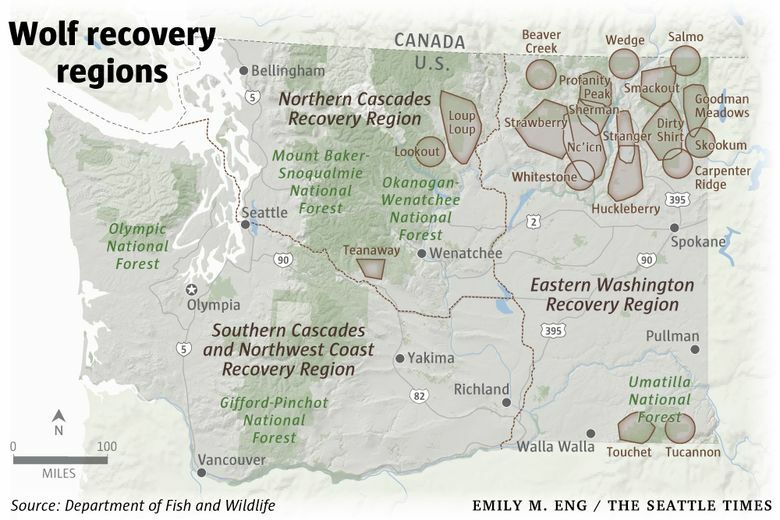 But they remain a state endangered species across Washington, and protected under the state’s wolf recovery plan. Wolves were shot, poisoned and hunted to local extinction statewide by 1930. 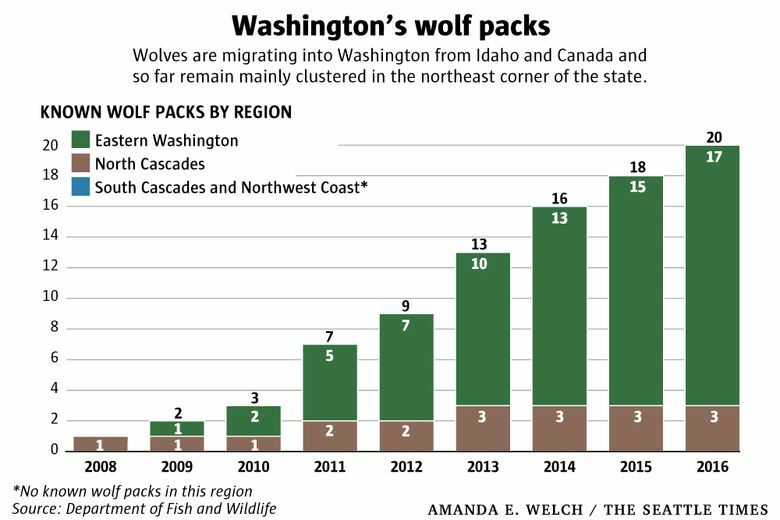 The first pack was not documented again in Washington until 2008. The wolf population has been increasing about 30 percent per year ever since, according to state estimates. 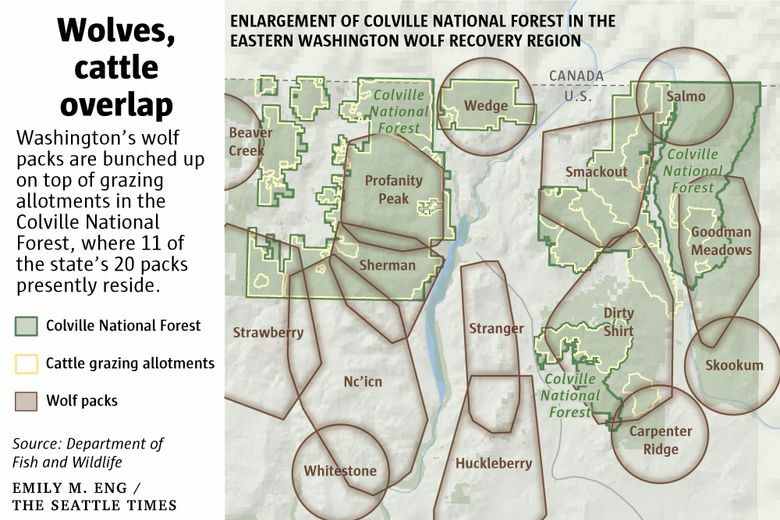 But the wolf packs clustered in the Colville National Forest have yet to disperse and multiply enough elsewhere for state wildlife managers to declare statewide success. That is resented by people here, where wolves are already thriving far in excess of the state’s own criteria for recovery. If anything, many people here are ready for a hunting season on wolves — as in Idaho, where nearly 400 wolves were killed last year, mostly by hunters. The goal embraced in Washington state policy is coexistence, including ranchers, livestock and wolves sharing the landscape, statewide. Grazing cattle in the national forest for part of the year is embedded in the economics for many ranchers. They save low-elevation, privately owned or leased pastures to grow the hay to feed their animals over winter, once the cows come down from the national forest in the fall. The mountain pastures also have green grass with higher protein in summer, with shade and fewer flies, and produce higher-weight cattle. The product of typical cow-calf operations using grazing allotments in the national forest is a healthy cow returned pregnant from a summer in the mountains, and a calf grown from just a few hundred pounds or less at turnout to some 600 pounds. Those animals are then typically fed grain in feedlots to fatten their muscle, producing marbled meat. Ranchers typically save out a portion of their herd each year, not only to continue to hone its genetics, but to retain the animals that know the routine of the rancher’s operation: where the gates and fences and water are, where the salt blocks are, laced with the minerals cows crave, to lure them to higher ground. These salting locations and water troughs often remain in place for decades, part of a culture learned by each generation of cattle and ranchers using the land. 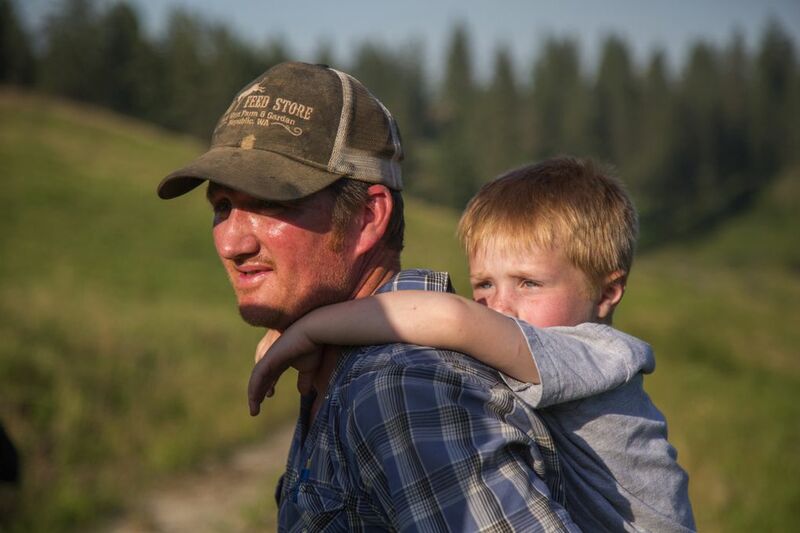 Each rancher has had to seek his or her own solution to the wolves’ return. Some have embraced help from the state, university researchers and conservation groups. Others have eschewed all three. Sanders and his wife, Laura, took what they call a proactive approach. They participated in a study at Washington State University, putting radio collars on some of their cows and using data from collared wolves to know where both were on the landscape. They put up flashing lights and flagging on fence lines, intended to keep wolves away. 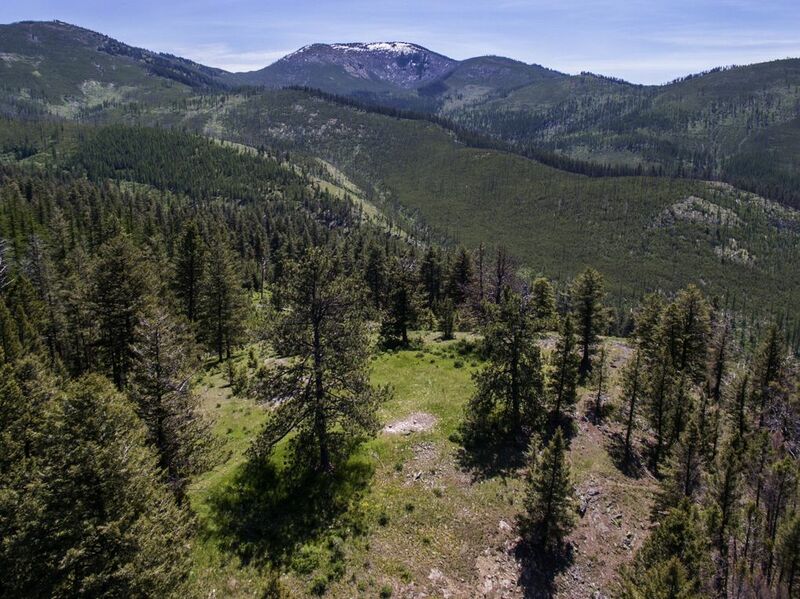 They hired a range rider to move on horseback through the pasture they lease in the national forest, in the heart of the Profanity Peak pack’s home range. So it was with horror last summer that they discovered the carcass of one of the fiercest animals in their herd, a bad-tempered, 1,600-pound cow, killed by the Profanity Peak pack. Laura figures she died defending her calf. “I don’t like the way they kill,” she said of wolves. She said she could see from the wounds that wolves had been on the cow’s back, and had chewed out her tongue. For a rancher who once hand-nursed a cow back to health, hand-blinking the animal’s eyelids all night when the cow was too ill even to blink, having one of her mother cows eaten alive was unbearable. People here will tell you that wolf kills are just part of their trouble. Even if not killed outright or injured, cows stressed by wolves lose weight, won’t breed and won’t stay in the forest. The nearby Diamond M ranch turned out its cows in the same place as always last summer and put out salt in the same location as usual, to draw the cattle to the high pastures. But what had usually worked before didn’t last year. Video footage shot at night — on a motion-activated wildlife camera that July as part of a WSU study — shows Diamond M cows lumbering down an access road on one of the Diamond M allotments. Then into the frame comes an adult wolf in pursuit. Big, powerful and headed straight after the cows at a purposeful trot, it’s every rancher’s nightmare vision. According to its 2016 report on the Profanity Peak pack, state wildlife managers had collared two wolves in the pack by June 12. 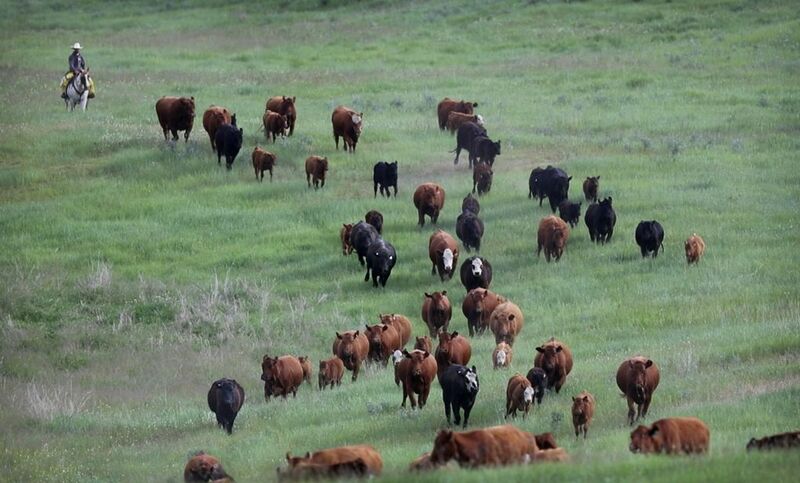 The Diamond M had already turned out nearly 400 cattle in cow-calf pairs on a 30,000-acre grazing allotment. The turnout site, state managers realized by the end of June, was within 4 miles of the pack’s den — nothing for an animal that establishes territories that average 349 square miles. The estimated territory of the Profanity Peak pack last year overlapped 11 grazing allotments, where ranchers turned out about 1,500 cow/calf pairs, or 3,000 cattle in all, to graze. The state didn’t urge the Diamond M to get a range rider out until after the first wolf attack July 8. The ranchers yanked the salt block inadvertently placed near the wolves’ activity area and hired two more people to patrol the allotment. Human presence didn’t make the expected difference: Diamond M owners even camped on the allotment and said they heard barking and howling within 30 yards of their tent. By August, the pack had eaten six cattle, and the state committed to killing off the pack. Wily, fast learners, wolves are hard to kill. Gunners tracked the radio-collared animals. The state spent $135,000 killing seven members of the pack. A female and three pups are known to have evaded helicopter gunners, ground shooting and trapping, and one pup remains unaccounted for. One adult female was shot and injured Aug. 22, then shot again and killed three days later. Outrage over the shooting and trapping campaign that went on for weeks spiraled out of control to death threats. “There is no word to describe it,” said Justin Hedrick, a co-owner of the Diamond M. It was the second year in a row the state had turned out gunners in helicopters to defend the Diamond M’s cattle against wolves (in 2015 it was the Wedge Pack) and people were blaming the ranch, which has held grazing permits in the forest for 73 years. In Olympia, Donny Martorello, the state’s wolf policy lead, became so fearful for his wife’s safety that as the summer wore on, he put her up in a hotel. Opponents of the killing also felt badly misunderstood and unheard, as the state shot seven wolves dead, all on public land. Hedrick and others here say the state should have acted sooner, before the pack got a taste for cattle, arguing that would have saved more wolves, and more cattle, too. Wildlife managers this year vow a quicker finger on the trigger, literally, with a policy adopted this spring to intervene sooner if wolves kill cattle again. The decision was met with skepticism among ranchers who warn it’s not enough, and outraged despair among opponents who want not a single wolf killed. 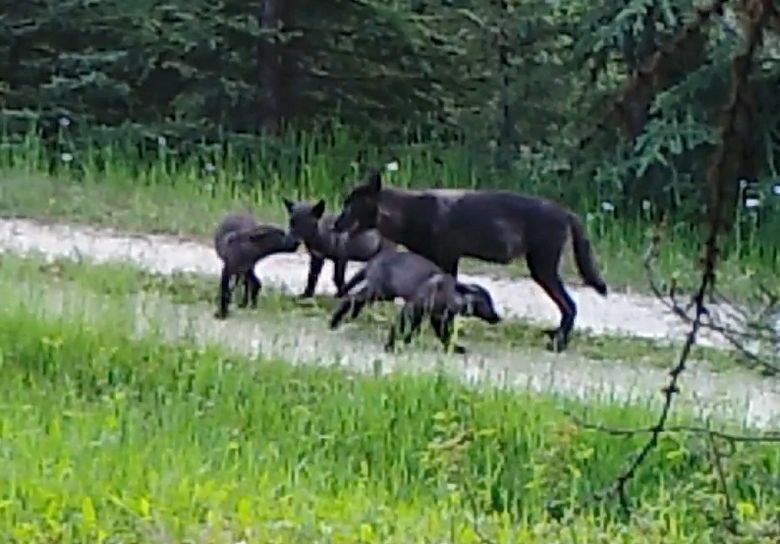 Laura Sanders said she feels for the sole surviving female wolf of the Profanity Peak pack, traveling alone with pups all winter. Like others, she said it is hard living with the new stress on ranching here. “But we are not quitters.” She also said she doesn’t like feeling misunderstood, even blamed, simply for being a rancher.